It is always so hard for me to resist those signs. Yard sale, estate sale, moving sale, it doesn't matter because even though most of those turn out to be a bust for furniture, there is always a slim chance I'm going to find a really nice piece. So I was on my way to the bank one day, not even thinking about raw materials, when I saw the moving sale sign. I wasn't even sure there was really a sale because it was unclear just where the arrow was pointing, and no cars were around. The garage door was open to a fairly empty space, but I parked and went in when a woman came out and waved to me. Turned out she was selling some things in the house that were actually still in use. How about the overpriced dining room buffet packed with office supplies? Some ugly light fixtures that were still installed? That was my sign that she wasn't too committed, so it was time to leave. 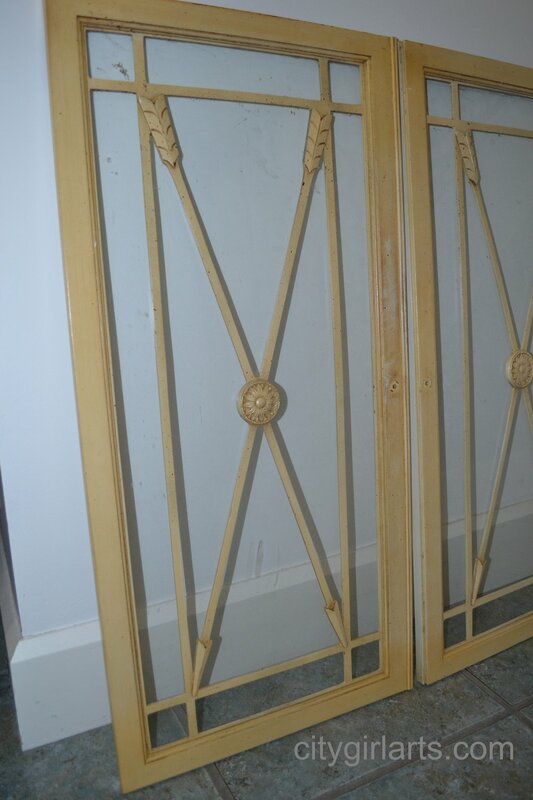 On my way out, opposite the door, in the mostly empty garage I passed through before, I spied a battered, half primed old china cabinet, its hardware and doors removed and stacked against the wall. I saw these. When I asked about it, she told me she had started to paint it but never finished. It had some veneer issues at the bottom from water damage, and I couldn't tell if all the parts were there, but I took a chance because it was obviously a very good quality wood piece and she was asking very little. As I was loading it into my car, she handed me a container with all the hardware she had already removed! Even though that hard part was done, I did have to learn to use a router on this one because the doors did not close properly. Now they do! The crossed arrows seemed to indicate a very formal theme, so I chose jet black with a golden interior. The arrows, the knobs, and the button-like medallions got some gilding wax to make them stand out. The whole look is very striking to me, and obviously to its new owner, because it sold fairly quickly at the Brocante Vintage Market, proving that you can't always tell what that arrow is actually pointing to! Follow my adventures on facebook, as well. Check out my shop on Etsy for more one of a kind pieces. I love to read your comments and respond by email.